Gone to See Patagonia 2010/2011. Photography Workshop with Thom Hogan. Day 20: Puerto Natales, Chile. Hostage Day 4. Day four in Puerto Natales. The Chilean Red Cross and Military organized safe passage out of Puerto Natales for the departure for all of the tourists being held against their will in southern Chile. We first had to get to the Red Cross refuge center that was set up in the E3 elementary school to register. Then it was a lot of waiting as the Red Cross tried to organize lists and priorities to depart. There were nearly 1000 folks in the refuge center. A doctor gave me some antibiotics for my upper respiratory infection (that was turning into walking pneumonia. This also moved me up the list so I was with the 2nd group to depart. While at the refuge center, we got a certificate from the Gubernator of Southern Chile stating that we had been detained against our will. This is a series of snapshots taken with a Leica D-Lux 5 camera documenting the day. Freedom at last. I ended up sleeping in the Punta Arenas airport lobby before getting the first commercial plane to Santiago the next morning. The road between Santiago, and the Santiago International Airport were still being blocked by the protesters. I have to thank Thom Hogan, Rob Noonan, Wilderness Travel, the Chilean Red Cross, and the Chilean Air Force for getting us out safely. Gone to See Patagonia 2010/2011. Photography Workshop with Thom Hogan. Day 17: Torres del Paine National Park to Puerto Natales, Chile. Hostage Day 1. 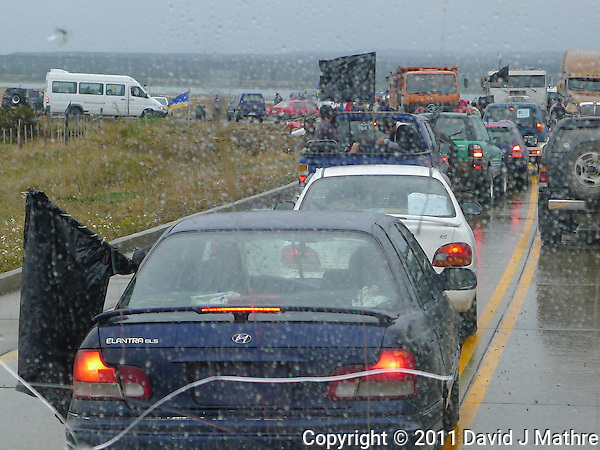 Roadblock Outside of Puerto Natales, Chile. Image taken with a Leica D-Lux 5 camera (ISO 80, 19.2 mm, f/3.3, 1/125 sec) from inside our bus. For what happened next you can check out an article written by Thom Hogan. Little did we know at the time what those black flags represented. 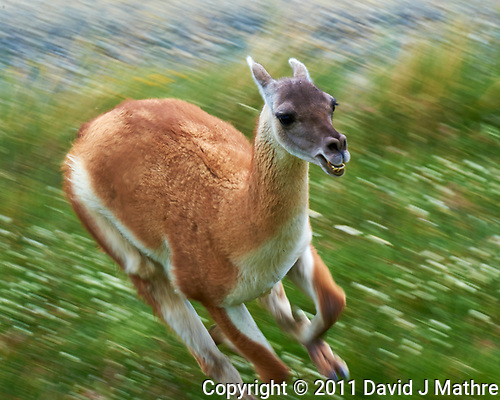 Not the way I wanted to end my wonderful Patagonia Photography Safari. Gone to See Patagonia 2010/2011. Photography Workshop with Thom Hogan. Day 16: Torres del Paine National Park Chile. Salto Grande Rapids just before the Waterfall in Torres del Paine National Park, Chile. Gone to See Patagonia 2010/2011. Photography Workshop with Thom Hogan. Day 14: Torres del Paine National Park, Hosteria Lago Grey, Chile. Rob walking a high wire in some pretty strong Patagonia winds at a construction site near Hosteria Lago Grey. Images taken with a Nikon D3s camera and 28-120 mm lens (ISO 200, various, f/4, various). Gone to See Patagonia 2010/2011. Photography Workshop with Thom Hogan. Day 13: Torres del Paine National Park, Chile. Sometimes you are lucky. A few days earlier Thom was teaching us how to photograph a rider on a moving horse. On this day, while waiting to be allowed to enter Torres del Paine National Park we were doing some landscape shots. All of a sudden two Guanacos started chasing and spitting at each other. I caught this one just as it ran right through our group.